Whimsical bowtie pasta tossed with shrimp, capers, and red pepper makes quick and colorful weeknight meal. Cook shrimp in a large pot of boiling water until opaque. Remove from water with a skimmer and rinse under cold running water; set aside. Reserve cooking water for cooking pasta, if desired. Cook pasta as directed. Rinse under cold water. Drain thoroughly. Combine shrimp and pasta in a large bowl. Add cucumber, green onions, red pepper and capers. Red Wine VinaigretteShake or beat vinegar, oregano, garlic, crushed red pepper, olive oil and salt and pepper together until well mixed. 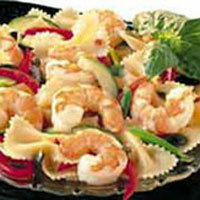 Pour dressing over shrimp and pasta; toss to mix well. Cover and refrigerate at least 2 hours to blend flavors. Serve cold; with or without greens.